Generation 1 custom pony figure customized as generation 4 My Little Pony Friendship Is Magic Fluttershy. Pose is custom-engineered. Body of g1 pegasus Medley, head from g1 Lickety Split. Entire pony had a layer of Gesso on the pony rubber so the paint would hold and stay solid. (roughing up the rubber of the pony with sand paper also works). Full body repaint in pale yellow acrylic paint in the pigment called Lemon Chiffon in approximately 5-6 layers. Cutie mark is true to Fluttershy, also hand-painted in acrylics. Eyes hand-painted too. 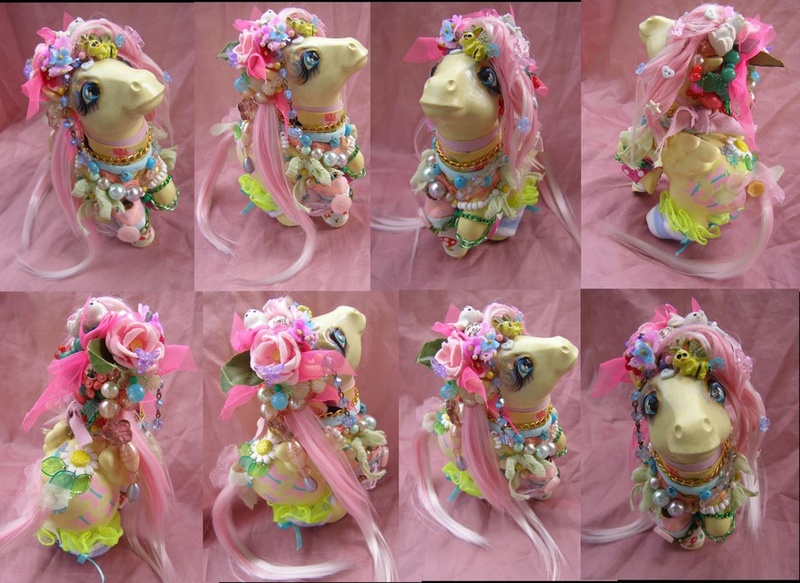 Mane & tail re-rooted in dollyhair nylon mlp hair in the colors Oyster shell and tea rose. Bangs styled in my hair gel method. Started with the hind legs. Stitched a powder blue/white striped cotton material to aqua silk and pleated ruffle neon yellow scarf material at the top. Finished with silk aqua ribbon. Next, the neck/torso portion. Started with golden brown mesh material, lined it with neon peach orange fishnet material. Neck, first layered with a pale mauve fabric, then a yellow printed fabric with black birds and pink flowers. Hemmed that with a strethy light aqua material. Stitched beads and gold chain. Front legs- Mushroom lace trim, aqua silk and a pink & purple scarf material at the top. Pale lavender bow tied, then green chain and a pink button to finish. Other front leg is a magenta and white polka dot ribbon and metallic green chains. Various strands of beads strung across the chest/torso region. Hair is embellished with strands of beads on floral wire, and some fake flowers. Gorilla glued a daisy above the cutie mark on one side and detailed it in green transparent leafs.